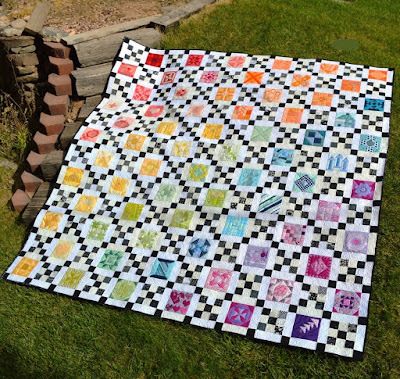 Happy Quilting: Splendid Sampler Finish!!! A Year to Make, A Year to Wait and finally, my Splendid Sampler is Done!!!! And I couldn't be more thrilled!!!! So ya, if you have been following along with my blog for a while, you know that pretty much every Saturday of 2016 was spent working on my Splendid Sampler blocks. And then in early 2017 I shared over here the book release and how I was so close to having my quilt top done. And I am happy to say, I finished the quilt top and the backing in May of 2017. And then somehow there was a Year Long Wait!!! Honestly, I don't know why it sat for so long. I knew I wanted to spend some time on it to really do some custom quilting in lots of colors, and there always just seemed to be a deadline that needed to be met. But lucky for me, I managed to create a deadline for this quilt, because nothing gets me to a finish like a deadline. So what is that "deadline" you ask . . . .Well it's the Splendid Sampler 2!!!! Yup, it's back again with 80 new designers and 100 new blocks ;) So exciting!!!! And I told myself what better way to celebrate the launch of the Splendid Sampler 2, then with the finish of my original Splendid Sampler!!!! I can not even begin to say how much fun I had making the blocks for this quilt. I delighted each week in picking out fun fabrics from my scrap bin in colors of the rainbow. I loved trying new techniques, and mostly, doing a lot of tiny piecing. And mostly, I loved getting to be a part of such a huge group of quilters working on this!!! It truly was a world wide project that made it just so amazing!!! And just fYI, that purple heart block above, ya, that's my block that I designed for the Splendid Sampler. It's called Lots of Love, and it was so fun to make ;) And all that love in the quilting made for lots of cool texture as well. How fun does it look on the back of the quilt!!! I love the swirls and arch combo, so neat!!! And since I am sure that little sneak peak of the back has got you wondering, here is a full shot of the back :) It's a Grunge Rainbow!!! Eeekkk, you all know how I am all googly eyes over Grunge ;) I used up all of the leftover yardage of Grunge fabrics that I had from other projects to piece this giant back and I just love it!!! And I have to say, I am just so happy with the layout I choose to highlight these blocks ;) You all know how much I love Irish Chain Quilts, so the idea to put these in an Irish Chain Setting just made me smile from ear to ear. And it turned out even better than I had seen it in my head!!! Now all you have to do is sew your rows together ;) I like to sew a Sashing Row to each of my Block Rows first (and two to the last row) and then I will Sew the Sashed Rows together ;) Just be sure to follow your layout!! And before you know it, you will have a super fun Splendid Sampler Irish Chain!!! And that is my Splendid Sampler Finish!!!! And I am just so super, duper excited that it is now all finished!!! This was truly a project that had a whole Lot of of Love put into it and I am so grateful to all of the wonderful friends that I made along the way. And if you missed participating in this Splendid Sampler, I would highly recommend popping over to the Splendid Sampler site and checking out the Quilt Along for the Splendid Sampler 2. It's going to be so much fun!!! That's all for today ;) I hope you all have a very Happy Quilting Day!!!! Melissa, honey, if ever I drooled over someone’s finish, now is that time. I can just imagine how magnificent it is in person! Love it. Thank you so much for the mini tutorial. My splendid sampler top has been done for a year too. Need to get a backing and quilt it. It is really beautiful Melissa. I love the way you changed the colors and placed them in the quilt. I bet it is indeed "Splendid" in person. Stunning! Now I got the incentive to finish my own Splendid Sampler quilt! That is a gorgeous quilt! Congratulations on a spectacular finish! This is an Awesome quilt! I'm sure you will enjoy this finish! Wow! Just wow! Your quilt is absolutely wonderful! So beautiful, quilting and piecing are stunning. Just beautiful! Love the Irish Chain layout. This is such a fun finish! It is practically perfect in every way. It is my favorite Splendid Samper finish of all! Thanks so much for sharing! I remember some of these blocks when you were piecing them! The quilt turned out to be gorgeous! Congratulations ;-). Reminds me i need to get back to mine! Your quilt is absolutely beautiful! I love all the elements - color choices, layout, the stitching - everything about it is beautiful and will be enjoyed by many generations I'm certain! Congratulations! This is so fantastic!!! I love it!!! Absolutely gorgeous!! 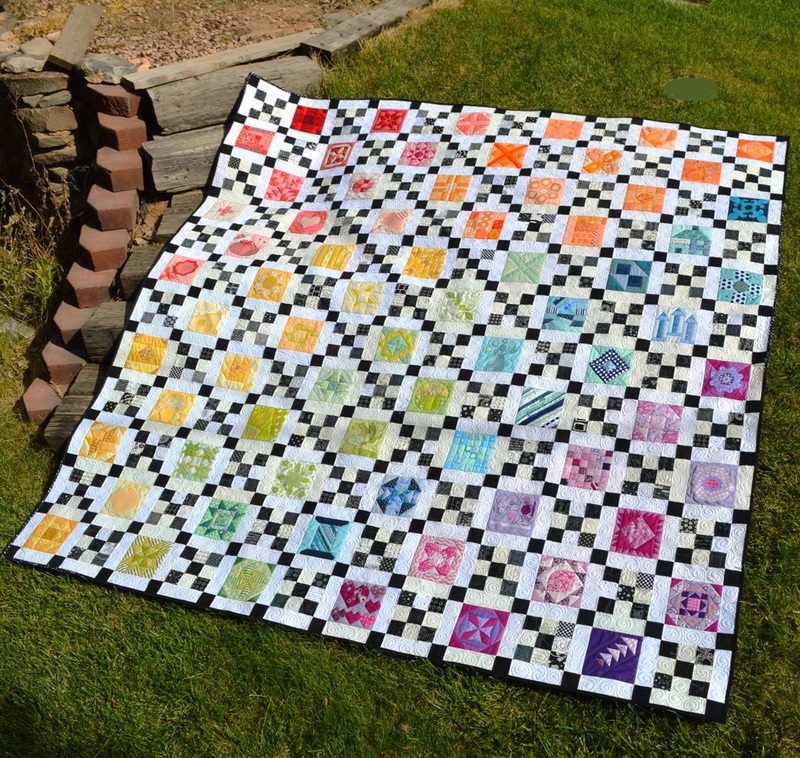 Love how this chain quilt makes each and every Splendid Sampler block shine!! It really looks amazing. Thank you also for sharing the amount of blocks needed for each size. Someday I will need to attempt one - love this! That is one beautiful quilt!! Congratulations on the finish! AMazing@@2 Thanks for sharing the setting. Beautiful!! and the setting, quilting and the backing...all wonderful!! Lovely setting! Motivates me to make the next Sampler!! Thanks for sharing your process. It's really fabulous. Congrats on a great finish. Love your finish and the rainbow effect. Should have known you would make even the splendid sampler an Irish Chain. Alas mine are still in a box being a sampler library inspiration, with a few last ones left undone. But it sure was fun and this looks like a great way to set them off.